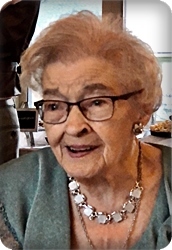 On Sunday, March 31, 2019, Arlene Marie Oosterhouse, age 90, of Grand Rapids, passed peacefully into the hands of her heavenly father. Arlene was a dear wife, mother, and grandmother, and enjoyed gardening and her flowers. She was preceded in death by her husband, John, three grandchildren, two sisters, and two brothers. She will be lovingly remembered by her children, Gary Oosterhouse, David (Rhoda) Oosterhouse, Roger Oosterhouse, Douglas (Linda) Oosterhouse, Linda (Mel) VanderBie, Michael (Jane) Oosterhouse, Janice (Doug) Polinder, Sandra (Jim) Schreur; 28 grandchildren; 25 great grandchildren; her sister and brother, Carole (Reg) Stallard-Babbey, Rick (Chantra) Laninga; her sisters-in-law and brothers-in-law, Alyce (David) Smith, Gerard Oosterhouse, Donald (Marlene) Oosterhouse, Carol Laninga; many nieces and nephews. Visitation will be held on Friday, April 5, from 5 - 8 pm at Stroo Funeral Home, and on Saturday, April 6, from 10 - 11 am at Princeton Christian Reformed Church, 5330 Kalamazoo Ave. SE, where the funeral service will be held at 11 am Saturday. Interment will take place in Kent Memorial Gardens. Memorial contributions may be made to Forgotten Man Ministries.